Some of the commissioned stories from both Re/place and Re/placed have gone on to be published – so you can enjoy them once again! From Re/placed in 2017, Nicholas Royle’s Safe came out in issue 8 (autumn 2017) of literary journal Confingo, David Gaffney’s The Dog and Elizabeth Baines’ The Next Stop Is Didsbury Village were published in issue 9 of Confingo in spring 2018, and Elizabeth’s was then picked for Salt Publishing’s Best British Short Stories 2018 anthology. From Re/place in 2015, David Gaffney’s The Staring Man was published first in Confingo magazine (issue 4, autumn 2016) and ended up in the Best British Short Stories 2016 anthology, while Nicholas Royle’s Miscue can be found in the Being Dad: Short Stories About Fatherhood anthology, edited by Dan Coxon. Kate Feld’s Longford Cinema piece (action shot below!) was recorded for Comma Press app MacGuffin and Adrian Slatcher’s Last Days Of The Midland can be experienced, alongside the accompanying Re/place(d) film, on YouTube. Sarah-Clare Conlon’s Re/place(d) piece, originally called Of Interest This Week, and one of her flash fictions from Re/place were published as companion pieces in the Dostoyevsky Wannabe Cities: Manchester anthology, which came out in 2018, as Flight Path: 1. One For Sorrow & 2. Two For Joy. Another of her flash fictions from Re/place was published online in spring 2019 at Reflex Fiction as Here Once All Fields. You can read it here. Re/Place(d) – site-specific storytelling is back! Re/Place returns as Re/Place(d) in the summer 2017, as part of Didsbury Arts Festival. We’re back, with four of the original team, as Sarah Butler, Sarah-Clare Conlon, David Gaffney and Nicholas Royle are joined by Elizabeth Baines and Adrian Slatcher for an exploration of people and places, in line with the festival theme of “roots”. From the Gates of Hell to a grand Victorian railway hotel, take a tour of Didsbury places and spot Didsbury faces through site-specific short stories, set against a backdrop of archive film and photography on 1 July 2017 at The Old Parsonage, Didsbury’s second oldest building; with a creative writing workshop the afternoon before. Re/Place(d) – stories that are right up your street. Supported by Arts Council England. Flyer thanks to Or8 Design. Always wanted to go behind the scenes in Longford Cinema or Cosgrove Hall? Ever wondered what the Sedge Lynn used to be or why Chorltonville is unique? Never knew about the Chorlton Park paddling pool or what happened to the Chorlton Green church whose graveyard and lych gate still remain? As part of Chorlton Arts Festival 2015, six critically acclaimed and award-winning writers each sharing an interest in psychogeography and urban exploration have penned pieces about ghost places and the re-appropriation of spaces. The result is Re/Place – stories that are right up your street. 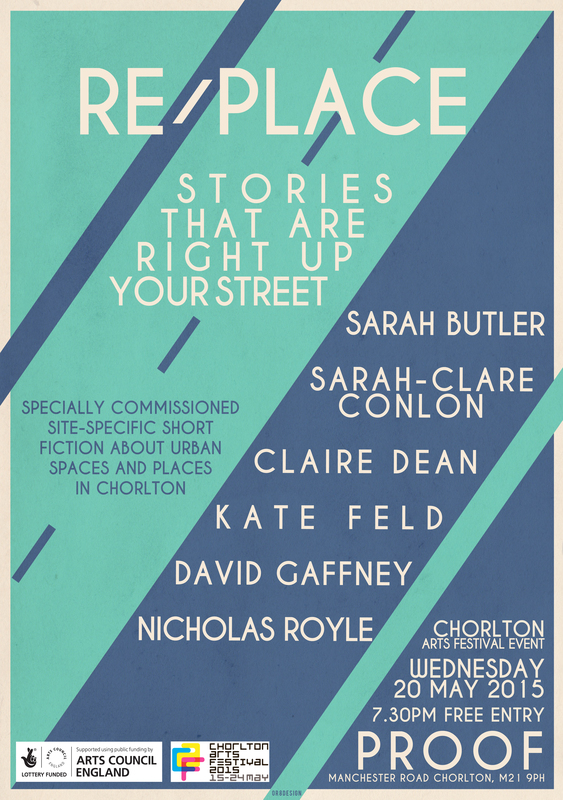 Sarah Butler, Sarah-Clare Conlon, Claire Dean, Kate Feld, David Gaffney and Nicholas Royle will perform their site-specific short stories and present postcards from the past at this special event, which takes place at Proof in Chorlton on Wednesday 20 May 2015 at 7.30pm. Free entry. Supported by Arts Council England. Thanks to OR8Design for our great flyer!